The strategic case for HS2, in terms of increasing rail capacity and generating regional growth, has still to be demonstrated clearly. “It’s too early in the High Speed 2 programme to conclude on the likelihood of its achieving value for money. Our concern at this point is the lack of clarity around the Department’s objectives. The strategic case for the network should be better developed at this stage of the programme. It is intended to demonstrate the need for the line but so far presents limited evidence on forecast passenger demand and expected capacity shortages on existing lines. It is also unclear how High Speed 2 will transform regional economies by delivering jobs and growth. The Department is trying against a challenging timetable to strengthen its evidence and analysis, which at present provide a weak foundation for securing and demonstrating success in the programme in future." In an early examination of progress by the Department for Transport in planning for the High Speed 2 rail network, the National Audit Office has expressed reservations about the Department’s business case. In particular, in presenting its case for investment in the project, the Department is said to have poorly articulated the strategic need for a transformation in rail capacity and how High Speed 2 will help generate regional economic growth. According to today’s report, the Department’s methodology for appraising the project puts a high emphasis on journey-time savings, from faster and more reliable journeys. However, the relationship between these savings and the strategic reasons for doing the project, such as rebalancing regional economies, is unclear. It is also unclear to the NAO whether the business case covers just the route between London and the West Midlands (phase one, due to open in 2026) or the full Y-shaped network with lines from Birmingham to Manchester and Leeds respectively (phase two, due to open in 2032). The Y-network has a stronger economic case but this is much less certain as route designs are less well-developed. The benefit-cost ratio calculated for phase one has twice contained errors and the Department has been slow to carry out its own assurance of the underlying analysis. The NAO’s opinion is that the Department and its advisers HS2 Limited should update the data underpinning some key assumptions in the ratio. The most recent benefit-cost ratio (published in August 2012) is 1.4 to 1 but is likely to change. This to be expected as the ratio is sensitive to changes in data underpinning assumptions, such as GDP growth forecasts. It does not, however, reflect the Department’s current assumption on the relationship between passenger numbers and GDP growth. The Department now expects passenger numbers to grow more slowly when GDP increases. 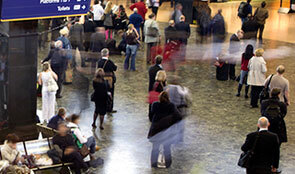 It should also carry out research into how business travellers use their time on trains. HS2 Limited has also not yet analysed the effect on passenger demand, revenues and the benefit-cost ratio of charging passengers premium prices. The report notes that the estimated cost of phase one will change as costs become firmer. In some documents, the estimated cost is between £15.4 billion and £17.3 billion but a new estimate is being developed based on a clearer route and more information. The NAO estimates that there is a £3.3 billion funding gap over four years (2017-18 to 2020-21) which the government has yet to decide how to fill.